Tina Charles and Brittney Griner each scored 18 points and the U.S. had 40 assists on its 46 baskets to beat China 105-62. The Americans were unchallenged in group play, winning the five games by an average of 40.8 points and will next face Japan in the quarterfinals on Tuesday. RIO DE JANEIRO — Geno Auriemma could only smile after his U.S. women’s basketball team dominated another opponent. It wasn’t so much the final score of the game, but the coach was really excited about the record number of assists the Americans dished out. 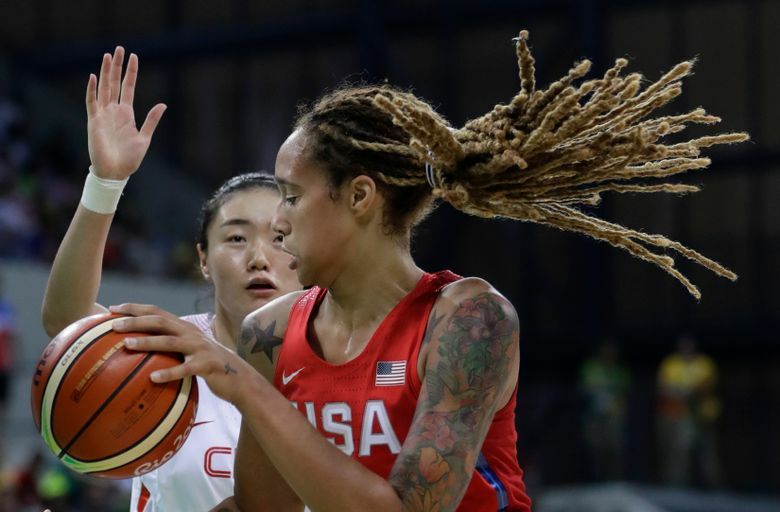 Tina Charles and Brittney Griner each scored 18 points and the U.S. had 40 assists on its 46 baskets to beat China 105-62 on Sunday. The Americans were unchallenged in group play, winning the five games by an average of 40.8 points, eclipsing the 100-point mark in four of them. It was fun for those playing as well. The U.S. is on a record-setting scoring pace averaging 104 points, just above the 102.4 mark set by the 1996 team that started the run of five gold medals and 46 consecutive Olympic wins. Things get more serious as the single-elimination quarterfinals begin Tuesday with the U.S. (5-0) facing Japan at 2:45 p.m. PT. Whether the games get more challenging remains to be seen, but the heavily-favored Americans need three more wins to capture their sixth consecutive gold medal. About the only thing that went wrong for the Americans Sunday happened before the game even started. Elena Delle Donne was accidentally poked in the eye by Tamika Catchings during warmups and didn’t play. Delle Donne spent most of the first quarter icing her right eye. Even without the reigning WNBA MVP, the U.S. was too much for China. The Americans jumped out to a 22-point lead after the first quarter as Charles, Maya Moore, Brittney Griner and Sylvia Fowles all got easy layups. Griner also had 13 rebounds to go with her points. The quartet has spent time playing in the Chinese Basketball League in the winters. The Americans set the tone for the game early. Charles had 12 points in the opening quarter. Players enjoyed putting Charles — and others — in scoring position. In the opening period Moore stole the ball, raced down the court and then threw an over-the-head pass back to Charles, who converted it into an easy layup. It didn’t get any better for China. Despite the loud contingent of Brazilian fans who were backing the underdogs against the U.S., the Chinese team trailed by 34 at the half. Storm player Breanna Stewart had 6 points and 3 assists for the U.S.
Mengran Sun scored 16 to lead China (1-4), which failed to advance to the quarterfinals for the first time since 2004. The Asian country fell to 0-8 against the U.S. in the Olympics.